Beef, pork, poultry and fish all belong on a weight loss menu. As long as you choose lean cuts and don't add a lot of fat during cooking, you can enjoy a serving for about 120 to 200 calories. Your weight loss efforts will also benefit from the high amount of protein in a serving, and if you choose fish, the omega-3 fatty acids may help reduce abdominal fat. Any meat you choose for a weight loss diet should be lean, or even better, extra lean. The U.S. Department of Agriculture defines the maximum amount of total fat, saturated fat and cholesterol that meat and poultry can contain to meet the criteria for lean or extra lean. To qualify as lean, it must have less than 10 grams of total fat, 4.5 grams or less of saturated fat, and fewer than 95 milligrams of cholesterol per serving. Extra lean meat must have half the total fat and saturated fat of lean meat -- 5 grams and 2 grams, respectively -- but it can have the same amount of cholesterol. You can usually count on certain cuts of meat to be lean, as long as you limit your serving size. When shopping for beef, the lean cuts include round steaks and roasts, such as top round and bottom round, top loin, top sirloin, and chuck and arm roasts, reports the U.S. Department of Agriculture. The lean cuts of pork include tenderloin, center loin and ham. For chicken and turkey, white meat without skin is an extra lean choice, while skinless dark meat is a lean choice, but only if your portion is 3 ounces or less. Ground beef is considered lean if it's at least 92 percent lean, which means it's only 8 percent fat. You'll get 125 calories in a 3-ounce serving of skinless turkey breast and 140 calories in skinless chicken breast. Dark meat always has more calories, so a serving of skinless dark chicken meat has 174 calories. Calories in pork are about the same as poultry, with a 3-ounce serving containing 120 to 180 calories. As a general guideline, beef is a little higher in calories, but it can still fit in a weight loss plan. If you limit your serving to 3 ounces, a piece of lean beef has around 170 to 210 calories. For so few calories, you can count on getting 20 to 28 grams of high-quality protein per 3-ounce serving. That's about half of the 46 grams that women need daily and one-third of men's recommended intake of 56 grams daily. Protein supports weight loss by helping you feel full and preserving muscle so that you burn more fat. Poultry and meat are also sources of B vitamins, iron, zinc and magnesium, reports the U.S. Department of Agriculture's My Plate. The B vitamins are especially important for weight loss because they keep your metabolism running. When you plan a weight loss menu, try to replace two servings of meat every week with seafood. This amount of seafood supplies the healthy omega-3 fatty acids that lower blood levels of triglycerides and help prevent heart disease. Pink salmon, trout and tuna or canned light tuna are good choices because they're lean and lower in mercury. A 3-ounce serving has 130 to 140 calories and 20 to 26 grams of protein. 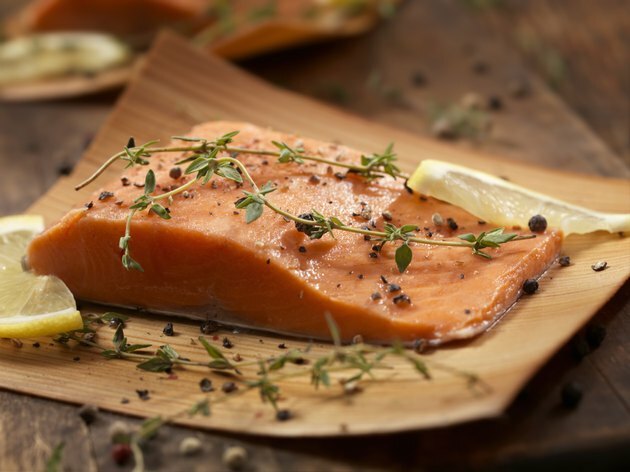 You could also choose other types of salmon, but they're in the calorie range of beef, with 200 calories in 3 ounces. The omega-3 fatty acids you'll get from fish may not directly contribute to weight loss, but they can still help. Researchers reviewed all of the research previously published that studied omega-3 fatty acids and weight loss. They found that omega-3s didn't increase the amount of total weight lost in study participants, but it did help them lose more abdominal fat, reported PLoS One in November 2015. More research is needed to verify this effect and to learn exactly how the fatty acids work to accomplish fat reduction. If you're not careful about preparation and cooking, you can quickly turn lean meat, poultry or fish into a high-calorie meal that won't help you lose weight. Trim any visible excess fat from meat and remove the skin if you bought poultry with skin. Don't bread or batter your protein because they add a significant amount of calories. Use cooking methods that reduce or eliminate extra fats. In other words, skip frying and go with poaching, grilling, baking or broiling the meat, poultry or fish. Roasting is also a good choice as long as the meat is on a rack so the fat can drain. If you need to rub the skin with fat before grilling or roasting, use vegetable oils -- liquid or sprays -- instead of butter. You can further reduce excess fat after cooking ground meat or ground poultry. After draining the fat, let the cooked meat drain on paper towels or clean coffee filters for a minute or two. Don't forget to blot the top of the ground meat. Cooked ground meat can even be poured into a strainer and rinsed with hot water to get rid of fat. Just be sure to let it sit in the strainer for about 5 minutes to be sure the water is well drained. Finally, don't top your meat, poultry or fish with high-calorie cheese or cream sauces.